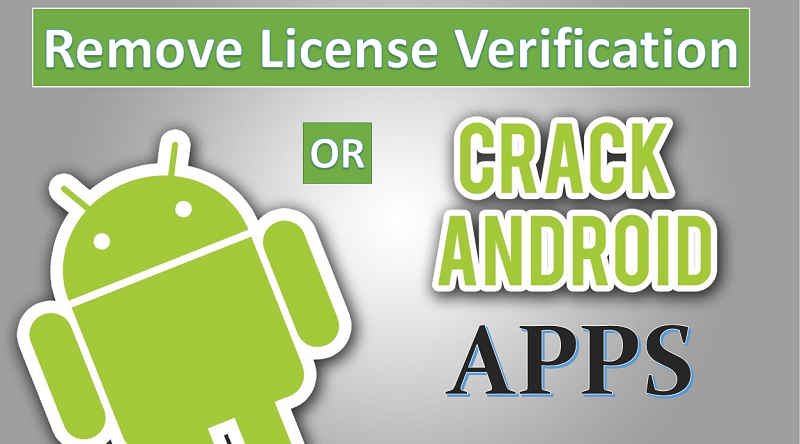 If you are looking for How to Crack Android apps or Remove license verification from Android app then this simple and extremely easy guide is for you. By following the simple steps you can crack all the Android apps & games with one click. And also you can modify the android apps using this method. Using the paid apps on your Android phone is costly and I know many people can’t afford paid apps. So I have written this guide to resolve this issue for all of you who wants to crack premium Android Apps easily. This method will also allow you to remove license verification notifications from the paid Android apps you install on your Phone. For example: When you download a paid app from the Internet for free then it will ask you to verify the purchase license for using the app on your phone. So when you downloaded it for free then you will not have a license to verify the purchase of the application. This trick will help you to bypass this license verification notification so that you can use the Paid Android Apps without any issue. There are many paid apps stores available to download paid apps for free on your Android smartphone. Some of those paid stores are Appvn Apk Store, Hipstore, ACMarket, All of these are developed to download paid apps for free. But when you download the apps from those stores then you might need to verify the purchase license of the app you have download. That is why for resolving this issue and remove license verification from paid apps, I have written this simple guide. So let’s get started. Note: You will need to root your Android Phone for Using this trick. Today in this trick we will use an app called Lucky Patcher to remove license verification of a paid Android app. I will explain the complete step by step guide to using lucky patcher for removing License Verification and cracking Android Apps. But first, we will talk about What is Lucky Patcher so you will have an Idea about the app and its features. I will explain the complete step by step guide to using lucky patcher for removing License Verification. But first, we will talk about What is Lucky Patcher so you will have an Idea about the app and its features. Lucky Patcher is an Advanced Android application which allows you to control all the installed Android Apps on your Phone. Using the Lucky Patcher you can do the various types of modifications of your Android apps. Some of the benefits or features of Lucky patcher are written below. Remove License Verification from any paid Android app using Lucky Patcher. You can also remove ads from any Android application. You can modify the app in different ways. There are many more features of the app you will know while using the app. Cracking Android apps becomes so easy these days with the apps like lucky patcher and it needs no technical skills to perform cracking or patching of the apps. However, there are few requirements for removing license verification or cracking and patching apps using Lucky Patcher, which I am going to tell you here. First of all, to crack Android App you need Luck Patcher Apk on your Android Phone. You must have a Rooted Android Phone. Your Android Phone must have Android Version 2.1+ Which is normally everyone have in current time. There are just three requirements your Android Phone must have to crack Android Apps and Games for free. Now Let’s have a look on the step by step guide to Crack Android Apps or Removing License Verification notifications from Paid Android Apps. As I already told you using this application you will be able to crack Android apps and games easily. Not only these controls but there are many more functions in the app which will allow you to control your Android Apps in a way which was never possible. You can follow the simple steps given below to crack android apps or removing license verification from paid apps. First of all, you will need to download Lucky Patcher app on your rooted Android phone from here. Now after download, go to settings > Lock screen and security > Allow unknown sources (turn the trigger on). After allowing the unknown sources, install the app on your Phone. When the installation is successful, launch the app on your Android phone. On the main screen, you will see a list of all the apps installed on your Android phone. Select the app which you want to modify or remove the license verification. Now from the menu click on “Open Menu of Patches“. When you click you will see few options to modify the app, you can select Remove License verification and tap on “Apply” for removing license verification. If you want to crack or patch android app then you can click on “Support patch for inApp and LVL Emulation” and Apply. So this is all you need to do for removing license verification or cracking and patching any paid Android app. It is super easy to do and anyone can do it by following the simple steps I have given above. If you like this method of cracking android apps then don’t forget to share it with your friends on social media. Have a query related to this article? Feel free to tell me in the comment section below!